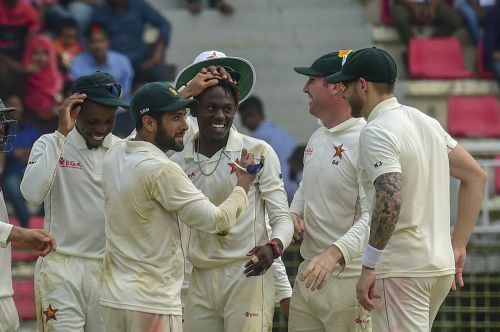 After a 3-0 drubbing in the ODI series in the hands of Bangladesh, a little was expected of Zimbabwe in the first Test match against the home team. Zimbabwe not only competed with the better-ranked side but also defeated them compressively to register an away Test win after a gap of 17 years. Zimbabwe opted to bat first after winning the toss and their captain, and opener Hamilton Masakadza scored a half-century. After the wicket of Masakadza, it was the Man of the Match Sean Williams who steadied the innings for Zimbabwe. Williams got out for 88 but his innings ensured that the visitors posted a total in excess of 200. Peter Moor, who was the unbeaten batsman for Zimbabwe in the first innings, too scored a half-century and helped his side post a first innings total of 282. For Bangladesh, Taijul Islam was the best bowler picking up six wickets in the first innings. During the chase, Bangladesh got off to the worst possible starts as they lost 4 wickets for just 19 runs. Mushfiqur Rahim and Ariful Haque tried saving the innings by scoring 31 and 41 respectively but the regular fall of wickets meant that Bangladesh could manage only 143 in the first innings. Unlike Zimbabwe's first innings, none of their batsmen could score a half-century as Bangladeshi spinners controlled the game. While Taijul Islam picked up his second five-for of the match, Mehidy Hasan and Nazmul Islam got three and two wickets respectively. The good show by the spinners meant that they could restrict the visitors to a sub-200 total in the second innings. Chasing a target of 321, Bangladeshi openers put together a half-century partnership for the first wicket but that was the only significant partnership of the innings. While Sikander Raza sent back three of Bangladesh's top 4 batsmen to the pavilion, Brandon Mavuta and Wellington Masakadza cleaned up the tail by picking up four and two wickets respectively. As a result, Zimbabwe bowled out Bangladesh for just 169 runs and registered an emphatic 151-run victory, their first Test win since beating Pakistan in Harare, September 2013. and their first away Test win since beating Bangladesh in Chittagong, November 2001. This is going to be a splendid result for Zimbabwe whose cricketers are to be greatly admired for giving off their best amidst so many issues around them. Beating Bangladesh in away conditions is not easy at all. That is an amazing win for Zimbabwe! Great stuff. Meanwhile Zimbabwe have beaten Bangladesh by 151 runs in first Test at Sylhet. Huge upset! 3rd away test match victory for Zimbabwe. Zimbabwe's 151 run win over Bangladesh is their first Test victory since September 2013.